Homes that still have plaster walls in prime condition are often valued by homeowners and home buyers alike. Not only are they beautiful and solid but they are especially good at soundproofing rooms. But plaster walls respond to inevitable foundation shifts and climatic changes and can begin to crack. Everyday life, with its bumps and bangs, takes its toll on plaster walls. And certain key areas, such as above and beside doorways and windows, are classic areas of cracking. Nearly all homes with plaster walls will eventually develop window and door cracks. 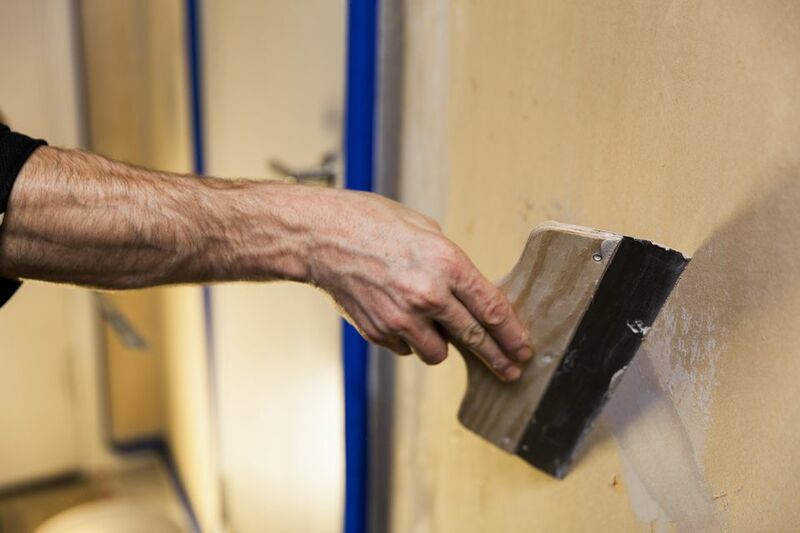 Though they may look scary, your cracked plaster walls are not beyond repair. You do not even need a special plaster repair kit. One way to quickly fix cracked plaster walls is with basic drywall tools and materials that you can easily and inexpensively obtain at a home improvement store. Understanding how plaster walls are constructed will help you fix your cracked plaster wall. The process is different for plaster than for drywall. If you have ever repaired drywall, you may know that it is often easier to replace entire portions with new pieces of drywall—it's possible to remove just the section that needs fixing and a few inches beyond, without the entire wall collapsing. Because drywall is one layer with no backing, once you cut through drywall, there is nothing behind it except for studs and insulation. Plaster walls, by contrast, are constructed of two layers: the outer plaster and the inner wooden or metal lath. With plaster, your best bet is to preserve the existing plaster and to fix it, rather than tearing it out. Ripping out chunks of plaster often becomes a seemingly endless process, with one chunk leading to another chunk. Successful plaster crack repair means taking it slow and being patient enough to add multiple layers of joint compound to the wall. With the putty knife, 5-in-1 tool, or a dull utility knife, score the crack to open its edges. While this may seem counter-intuitive, you need to increase the area for the joint compound to stick. Do not vigorously scrape into the crack; be gentle and go slow. With the shop vacuum, remove all crumbs and dust from the crack. Measure and cut one or more lengths of paper drywall tape to fit the crack. Drywall compound begins to dry quickly, so cutting the tape in advance makes this work go faster and prevents accidentally creating creases, folds, or bumps. Use scissors to cut the tape, as tearing the tape by hand will produce a ragged edge. Stir up the joint compound, then put a small portion on the edge of the six-inch taping knife. Smooth a thin layer of joint compound over the cracked section. Move immediately to the next step, as joint compound dries rapidly. With the 6-inch knife, press the paper tape into the wet area, directly over the crack. Smooth over the tape with the knife just once or twice. Too much knife-work at this point may tear the tape. Let the joint compound fully dry. Add a layer of joint compound over the taped area so that the compound extends a few inches past the taped area. Let the joint compound fully dry. Lightly sand it down with fine sandpaper to smooth prominent bumps or ridges. Do not sand so hard that you dig into the tape. Add a third layer of joint compound, this time using the 12-inch knife to extend the edges even farther. This last coat should take the joint compound out as far as 12 inches. Allow the joint compound to dry completely, then sand lightly to smooth out the repair area. Again, take care not to sand down into the paper tape—a very light sanding is all that is required. After sanding, clean the surface with a shop vacuum and wipe it with dry cloths. Any area that has been patched with joint compound must be primed before painting.